Hi, my name is Hannah and I am a Lifelong Learning Officer with the Giving Nature a Home Project in Glasgow. I'm taking a few days out of my normal job teaching to take part in some of the fantastic events happening across the city as part of the garden festival. It's only been on for a few days so far, and I'm completely exhausted from taking part in such a variety of activities. Still two weeks to go, and I'm not sure how I'm going to keep up with it all! After the opening gala (more on that later), my first event was a nature walk outside Glasgow in the village of Uddingston. The local community in Uddingston do an amazing job around the village, and have recently been awarded a silver gilt award from Beautiful Scotland for all their efforts. 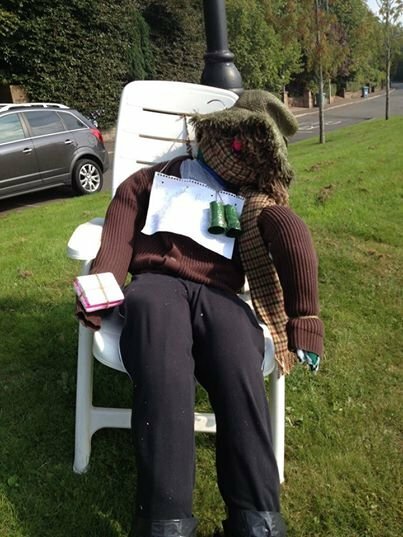 It was definitely well deserved: check out the Uddingston scarecrow created as part of the festival in neighbouring Bothwell, with a suitably RSPB theme! We had a really charming walk, taking the path along the Clyde to Bothwell castle. We spotted cormorants and a heron along the river, as well as chatting about a lot of plant and tree species found in Glasgow. People that joined us on the walk also learned a lot from our resident bug expert Paul Gunn, including me! 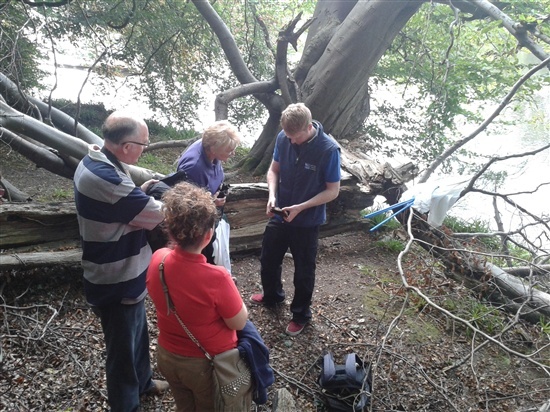 Here are some residents investigating a rare beetle found on the way, a minute brown scavenger beetle. I also had the good fortune to spend a gloriously sunny September day with our partners Wild by Nature in Kelvingrove Park. 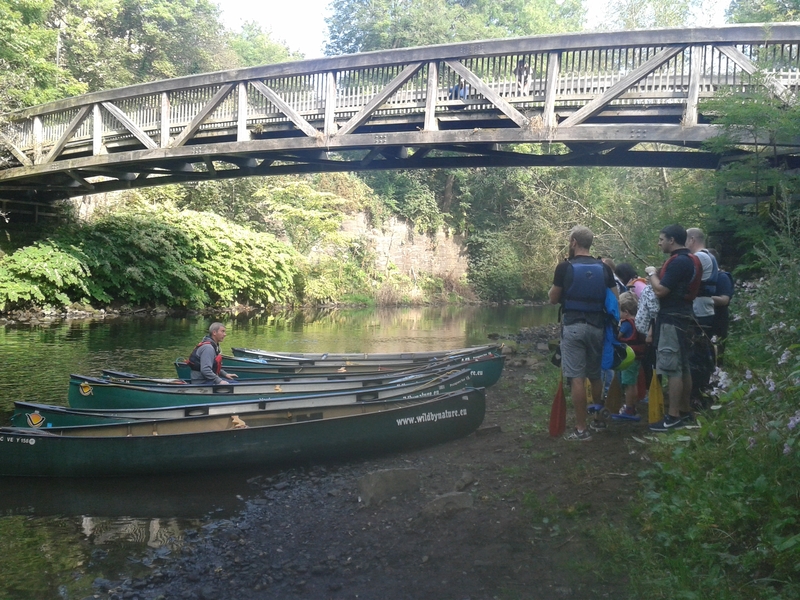 People coming through the park had the chance to explore the Kelvin from a completely different perspective: by taking to the water! We brought canoes to the park, and we took to the river for a gentle paddle down the river looking for wildlife. I was especially lucky, as I had a superb view of a male kingfisher flying past the boat, with the iridescent orange and blue colours flashing in the sunshine. I am still amazed by the diversity and amount of wildlife that lives in the centre of Glasgow; from dipper and kingfisher to otter and water vole, we are incredibly lucky to live with some amazing native wildlife right in the middle of the third biggest city in the UK. 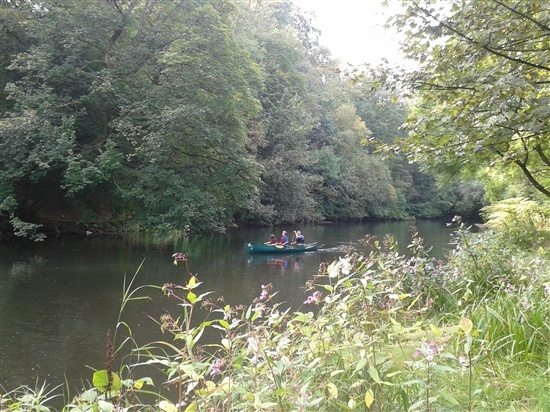 Getting a chance to be out on the river was a real privilege, and I know a lot of the people that took part in the canoe trips were blown away by the tranquility and beauty of this urban space.